Sweater: Marc Jacobs (cardigan version here). Leather Purple Skirt: Marc Jacobs. 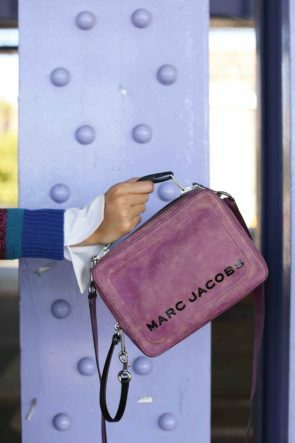 Bag: The Marc Jacobs Box Bag. In love with your bag and how you styled your look! Looks like a lunch box but you make it work so well! That bag is gorgeous! And I love the bold colors in this outfit! I’m commenting on the 9/20 post. No reference/link to your adorable shoes!!!! Where can we get those shoes??? Great post and outfit! This bag is so pretty, especially the color! Great bag ! I love the colors of this outfit. Oh my gosh, Blair. These colors are so good together. And this bag? I NEED. The bag is lovely, but I really love the rest of your outfit. The mix of colors and patterns is gorgeous. OMG love this bag Blair!! “Wow, that’s a pretty outfit! Of course, you look gorgeous! I love absolutely everything about this look, especially the bag! Excellent appearance! With this image, the scarf “Liquor Glasses” would look good, see the link below. Love your outfit. Where can I get this coat? I LOVE it!